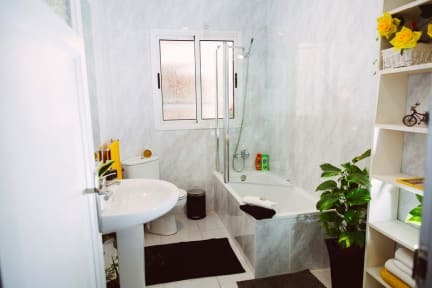 Rooms Hola BCN offer rooms with a modern design, air conditioning, free Wi-Fi, shared bathrooms and a well-equipped kitchen that our guests can use free of charge. The area hosts multiple bars, restaurants, clothing stores, architecture landmarks and more. The area is well connected, with bus stops, metro and railway stations nearby. The metro station Rocafort (Line 1) is only 150 m away. We are situated in the heart of Barcelona, so there are plenty of sights and tourist attractions in the area. The famous Plaza Catalunya, Las Ramblas, and the historical center of Barcelona, with its numerous landmarks, are only minutes away. Passeig de Gràcia is a shopping street containing several of the city's most celebrated pieces of architecture. Plaça Espanya, that features Venetian Towers, Fira de Barcelona exhibition center, and a shopping center Las Arenas, is located nearby as well. A short distance away you will find Font Màgica fountain, the Palau Nacional and te Montjuïc mountain.